Why build a pair of speakers? I have to say that I was, and still am, almost content with my existing system. This has remained pretty such constant for the last five or six years, mostly because of lack of funds, but also because there are a lot of things about it that I like very much. I won't say much about the source components, except to mention that I listen to the radio (BBC Radio 3, mostly) more than to other sources, and that the others are (in decreasing order of preference) black disc, CD and cassette. My musical tastes are pretty wide-ranging. My greatest love has always been classical music, particularly piano music (I used to play the piano obsessively when I shared a house with one), chamber music and twentieth century instrumental and orchestral music, but I also have quite a large collection of what might be called "classic" rock (mostly 1970s and 1980s progressive and heavy rock), while beyond this my tastes range into contemporary pop, folk, jazz and "world" music. An interest in practical electronics from my teenage years resurfaced eight or nine years ago, and this combined with my new passion for audio equipment, leading to some rather unnatural offspring, to date including several power amps, the Velleman FM tuner kit and a preamp containing Ben Duncan's fine ADEQ phono stage. 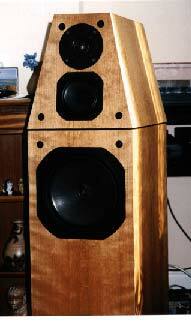 My regular speakers were ProAc Studio Ones, mounted on 45cm two-pillar Target stands. These are beautifully-finished medium-sized "bookshelf" speakers, with a SEAS fabric dome and a 17cm Scan-Speak paper mid-woofer. I promptly invalidated the guarantee on them by removing the crossover boards from the cabinets and splitting them, so that I could passively bi-amp the speakers. I was using a pair of modified Croft 5 stereo valve power amps, which can supply all of 25 watts per channel, and I found that adding the second proved to be a significant improvement, with better detail and control at higher volumes, presumably because the Crofts have limited output capability at the frequency extremes. The combination of the valve amps and the ProAcs gives a lovely warm and lively sound, with pin-point imaging and plenty of detail, though they are limited in bass extension and can sound a little thick in the midbass, noticeably in large orchestral works. So, I wanted more of a feeling of "scale", a more extended bass and treble, together with more control in the lower octaves. The latter suggested a solid-state power amp, but when I tried putting a pair in the place of one of the Crofts to drive the mid-bass, I found I lost some of the lovely richness in the midband. Three-way systems allow more choice in driving amplifiers, as well as having potential advantages in power handling and off-axis response, but most commercial three-ways are either very expensive or suffer compromises in driver quality, crossover design or driver level matching. So, I could have simply bought one of the many DIY kits on the market, or perhaps tried to copy one of the many interesting designs from magazines or the Internet. I considered this option briefly, but the impetuous and proud side of me wanted to produce a design that I would feel was something I had created myself. Again, I could have started with something unchallenging for my first DIY speaker project, but I felt I would probably end up with results that didn't sound much better than my ProAcs, and certainly wouldn't look better. As it happened, I may have been a little over-ambitious, but only in the sense that I need to upgrade my house now! 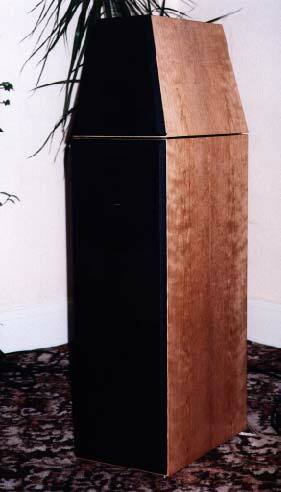 Now, I have heard a few systems over the years, and various speaker systems have impressed me, for different reasons. Martin Logan electrostatics: Wonderful deep sound stage you can almost walk into, and an open delicacy that is very seductive. They wouldn't work anywhere in my little suburban semi, though. ProAc Response series: I have always liked the ProAcs for their general "rightness" (a very subjective thing!) and accommodating nature. They also come in beautifully veneered cabinets. Quad electrostatics: I haven't listened to these legendary designs as much as I would have liked, but I recently heard the Bach B minor Mass emanating from a pair of their new ESLs at a Hi-Fi show, and was bewitched by the subtle understatement and openness of the sound. They are very expensive and, like any dipole speaker, hard to site in a small room and lack real bass power, but there are many who find the unique virtues of the Quads outweigh their weaknesses. SD Acoustics OBS and SD1: Again, I'm not really sure why I liked these open-baffled speakers so much when I heard them - they are a little coloured, but sound rather nice, open and unconstrained. Snell J and K: I have heard the older versions of these with Audio Innovations or Audio Note valve amps, and they have an appeal that surprises, given their basic and old-fashioned looks. They sound open and lively, with good sound staging. Sonus Faber produce a range of beautifully finished speakers which, like the ProAc Response series, produce a very listenable sound at the same time as excellent soundstaging and detail. 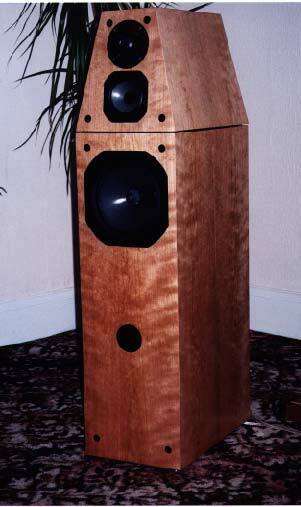 The stunning-looking Amati Homage, with Scan Speak drivers and a complex and original cabinet construction, was for me the best speaker of the 1998 Hi-Fi Show at Heathrow. They again gave that rare impression of "rightness", at the same time as having a cavernous soundstage and great presence. Wilson Audio System V: My reference for sound staging and tonal neutrality, though they can be a little too literal and analytical in the wrong system, and their treble is very fussy about the quality of the rest of the system. Measurements of the Focal titanium tweeters in other systems show a rather unsavoury spike at around 14kHz which worries me, although Wilson may have cured this for the Watt V. Their design rationale puzzles me, particularly the fact that a three-way speaker system with the aspirations and pricetag of this one doesn't have a dedicated midrange driver. All the same, their sound staging can be spectacular, and when fed from a muscular amp their dynamics are frightening. 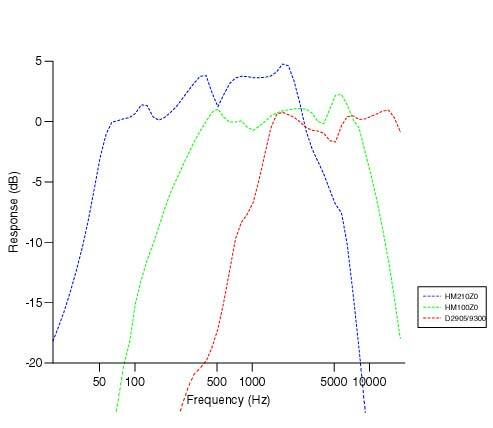 I was familiar with the articles in Hi-Fi World on speaker designs using the Audax High Density Aerogel (HDA) drivers, and they appealed to me instinctively - the 10cm HM100Z0 midrange has a wide and flat frequency response across the band, and I had heard encouraging descriptions of its "electrostatic-like" clarity. The HDA range also have the bonus of high sensitivity, with all drivers doing better than 90dB/1W/1m. I used this driver rather than the larger HM130Z0 unit, because of the substantial dip in the centre of the latter's frequency response. The HM100Z0 seems to have a resonance at just over 5kHz, which shows up on Audax' waterfall plot for the driver, but not in the regular frequency response plots, and may or may not need a notch filter in practice. I chose the 20cm HM210Z0 woofer to match the midrange; because of the stiffness of the cone, this should give very low intermodulation distortion. The combination of lightness and excellent self-damping gives a well-controlled high-frequency rolloff for both drivers, without the nasty cone breakup modes of carbon-fibre and Kevlar cones, though I have read that the Audax woven carbon-fibre drivers suffer far less from this problem. I have heard the Scan-Speak 8545 and 8555 carbon/paper mid-woofers in two or three designs (not least the Wilson Watt V and the ProAc Response 2.5), and was seriously impressed, though they are very pricey. They aren't really dedicated midrange drivers either, having quite a limited upper frequency extension, with serious breakup modes imposing strict limits on crossover frequency. All the same, I might consider them for a future project. The choice of tweeters was wider. I was tempted by ribbon drivers, but decided against them on the grounds of their off-axis response - I didn't want to lose the treble once I stood up. They tend to have a low impedance, particularly at high frequencies, which wouldn't make my little Croft power amps happy, and they also tend to like being crossed over at a higher frequency than moving-coil tweeters, making crossover design trickier, although the (very expensive) Raven mid/tweeters are a prominent exception. The Audax HD-3P gold dome tweeter is an exciting proposition, but is expensive and again needs a high crossover frequency. I had read good things about the better Dynaudio and Scan-Speak tweeters, and was swayed by Lynn Olson's glowing recommendations to go for the Scan-Speak D2905-9300, which comes at a reasonable price, comparable to the other two drivers in this project, and has a low resonant frequency and a good, clean high frequency extension. 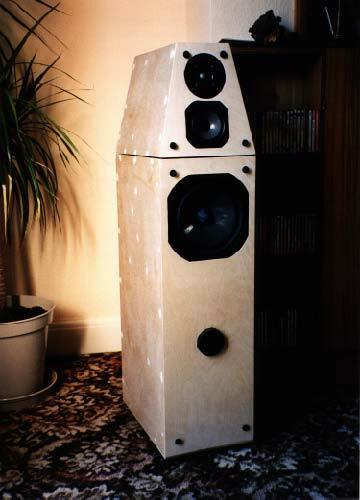 Stewart Tyler uses the D2905s in the senior ProAc Responses, including the 3.5, one of my favourite speakers. The 9500 is a plug-in upgrade, with some of the features of the costly 9900 Revelator, but retaining the faceplate and the ferrofluid from the 9300, and I may try it in the future. What measurements I have seen suggest that the 9300 has the flattest frequency response of any of the Scan-Speak range, and is in fact one of the best tweeters on the market (see Philip Bamberg's revealing measurements, which show how smooth the 9300's response is, compared with other highly-rated tweeters). The plot on the right shows the manufacturers' supplied frequency responses for all three drivers. Each of the drivers has a response which is within +-2dB across the intended passband, and there is a fair amount of overlap, which should make the design of the crossover easier. I could have put them in a closed box, for which the T-S equations give Vb=26 litres and f3=68Hz for a Butterworth alignment. This is a nice small box, but such a high f3 seems a waste of a large driver. I decided to forego the advantages of a closed box (chiefly ease of design, shallower rolloff and better phase behaviour), and go for the riskier solution of a ported box. I aimed at a QB3 alignment, which gives a good compromise between bass extension, control and box size. Substituting values into the equations in Vance Dickason's Loudspeaker Design Cookbook (4th Edition) gives a box size of 42 litres, and once I had added the substantial bracing to the boxes (just over 50 litres internal volume), my guess is that that is more or less what I have. When it comes to choosing an appropriate port, one has to compromise between power handling and port length (both vary as the square of the port diameter). I decided to sacrifice ultimate power handling, using a relatively narrow and short port, and avoid the pipe resonances of a long tube. I found some 2.5" (6.4cm) internal diameter black PVC drainpipe in B&Q that seemed perfect for the job. Dickason's equations prescribe a length of 10cm for a 6.4cm diameter port, while Audax' own data sheet suggests several alignments, with the best-looking curves corresponding to a 35 litre box with a port 5cm in diameter and 4.6cm long on the one hand, and 75 litres with a 7.5cm diameter, 3.6cm long, port, on the other. Hi-Fi World's KLS9 two-way uses this driver in a 72-litre box, with a 4cm diameter, 4cm long port. Their now-discontinued three-way KLS6, which also used the HM100Z0 midrange in an interesting open-backed arrangement, had a 75-litre box, and a pair of 3.8cm diameter, 8.5cm long ports (having the same area as a single 5.4cm diameter port). All these alignments have an Fb of 35-40Hz, with varying degrees of peaking - The KLS9 design, in particular, is intended to have a certain amount of bass boost, using a short port. I feel personally that a peaky ported box is undesirable, especially in a small room. As a complementary check for the box alignment, I used the design equations from the Speaker Building Page, making the box resonance frequency Fb a function of the port dimensions, and plugged in the parameters for the HM210Z0 in a 45-litre box and a 6.4cm diameter port to get some frequency responses. The results were interesting - the flattest curve corresponds to a port length of about 10cm, while shorter ports give bass peaks, and longer ports produce a lower Fb and more output at very low frequencies, but with the rolloff starting higher up in the bass. I tried shorter and longer ports in my speakers, but in my listening room and with typical programme material I couldn't hear much of a difference, so I settled on the 10cm length as a happy median. Having decided on a three-way system, the obvious choice was a fourth-order Linkwitz-Riley for both crossovers: this sums to a flat amplitude response with good attenuation out of band, and with the two crossover points separated by only about a decade, I thought the latter consideration was important. Now, I started off on the crossover design disadvantaged, in that I had no acoustic measuring equipment. In an ideal world, I would be able to measure the on-axis acoustic response and phase of all the drivers in their boxes, and also the complex impedance at all frequencies. It would also be nice to measure the off-axis response, and produce a waterfall decay plot to help ferret out any mechanical resonances or reflections in the boxes. I would then use a crossover optimisation program to generate an ideal crossover response to produce a perfect fourth-order (or whatever) combined response for each driver (actually I'm working on one, but without proper measurements it's not much use!). What I have instead is a set of response measurements of each driver; midrange and tweeter in an IEC baffle, and woofer in an enclosure of some reference volume, as well as plots of the impedance magnitude of each. I have no phase measurements (although assuming the drivers are linear phase, and then calculating the Hilbert Transform, suggests that phase isn't that important within the passband), and very little information of off-axis response or of what might happen when the drivers are mounted in a given, real-world baffle. The response curves and Thiele-Small parameters supplied for the drivers were correct (and the former not modified too much when mounted on my choice of baffle). I was far enough into the passband of each driver to be able to ignore the amplitude and phase effects of acoustic rolloff. I could ignore the phase of the drivers (actually pretty closely related to the previous assumption). The off-axis response was well controlled. The mid and treble could be impedance compensated to a simple resistance using an appropriate Zobel (or other) network (see further on for some discussion on this). There are other assumptions, of course, but you could go on forever. I was keen to get some sound out of the boxes and, most importantly, most of these are issues which can be, in principle, resolved electrically in an external crossover circuit (or two!). As it turned out, I put most of the effort into the cabinets, and decided to build, on the first iteration, as simple a crossover setup as I could get away with. I made a guess that I could make these speakers sound at least very good at the first attempt, and then work on more time- and energy-intensive improvements later. The woofer-midrange crossover point in commercial three-way designs tends to be in the range between 200Hz and 550Hz. The lower limit depends partly on the power handling of the midrange unit, and partly on its low-frequency rolloff. The HM100Z0 is a diddy little thing, with a high resonant frequency of 250Hz - even 1V RMS applied at 250Hz produces some uncomfortable noises from the driver. The upper limit is easier to justify; with a 21cm woofer and a 10cm midrange, the centre separation is going to be at least 16 centimetres, and probably 20. The latter corresponds to half a wavelength at 850Hz. Ideally we need to get well under a quarter of a wavelength at the crossover frequency between the drivers, corresponding to 425Hz. The pistonic range of a 21-centimetre woofer, according to the standard formulae, extends to 630Hz, by the way. In the end, I chose 400Hz as a working compromise. I could have gone lower, at the cost of higher distortion in the midrange (and moving further away from the flat portion of its range), but with the advantage of increased range between the crossover frequencies. The fourth-order active low-pass and high-pass L-R filters were implemented with standard Sallen and Key op-amp circuits, with each leg preceded by an amplifying buffer whose gain could be adjusted to optimise the signal-to-noise ratio, with the outputs attenuated correspondingly. The gain of the low-pass legs was adjustable by means of a 10k dual potentiometer - the Bourns plastic film pot I used didn't have particularly good channel balance, resulting in a difference of 0.6dB in the middle of its range, but I suspect that this won't be audible in the sub-400Hz range. The crossovers were hard-wired on matrix board using metal film resistors and 1% polystyrene capacitors, with two pairs of LM317/337 regulators for each channel; power supplies were fully dual-mono, partly to minimise crosstalk, but mostly to maintain the integrity of the system earthing. The single op-amps are OP-27, while the duals are RC4227 (PMI or AD dual OP-27). The photo is of the first incarnation of the active crossover, which is very much a prototype! I plan to rebuild them on decent printed circuit boards with proper ground planes when I've finished tweaking and have the time and the PCB facilities. I measured the responses of these filter circuits. The solid curves are the target responses, with the dotted and dot-dash lines showing the measured responses. The accuracy is generally better than 0.2dB across the range for both legs, which is satisfying, and the channel balance (disregarding the total gain) is even better, which is probably more important than the absolute accuracy. To start with, I planned to use a three-way active crossover, partly for ease of tweaking, and partly to avoid the problems created by the effect of frequency-dependent driver impedance on passive crossover networks. When I connected the whole thing up, though, I found that there was audible hum and buzz from the speakers, together with a hiss from the tweeters (not to mention intermittent radio pickup from the active filter section, but that was relatively easy to fix.). The hiss was mostly due to the high value of the input potentiometer on the high-pass filter, but I realised that the noise from the midrange unit was an inescapable consequence of using a highly-sensitive driver (93dB @1m/1W) on the output of the Croft 5. With the ProAcs, by contrast, the combination of the lower sensitivity (around 87dB) and the passive crossover render any noise inaudible at more than half a metre or so from the speakers. On top of this, the noticeable buzz coming from the tweeters is made worse by the fact that the mid-band noise, that would have been below the passband of a passive high-pass filter, is passed unattenuated to the tweeter. Now, I could have simply used a super-quiet solid-state power amplifier instead (I had a couple to hand), but I was swayed both by the fine sound quality from the Crofts and by the practical advantages of only needing two power amps per channel for a semi-active setup to consider a passive crossover between mid and treble. I didn't consider implementing the bass-mid section as a passive crossover, since the capacitors and inductors are rather high in value and expensive; on top of this, using a proper three-way passive crossover makes independent tweaking of each section nearly impossible. The insertion of the passive crossover also improves my peace of mind, since it reduces the chances of a transient at the amplifier output blowing the tweeters, even if the D2905 are more robust than most. I used textbook fourth-order Linkwitz-Riley filters in the low-pass and high-pass legs of the passive crossover, with impedance-compensating networks for both drivers, and an L-pad attenuator to reduce the signal to the HM100Z0, which is about 3dB more sensitive than the 9300, with the attenuation adjustable in steps of 0.5dB. To get more practical values for the inductors, I moved the crossover frequency down from 3.5kHz to 3.38kHz. This has the additional advantage of moving the crossover point marginally further away from the HDA driver's rolloff and eventual substantial resonance at 5.5kHz (this latter isn't so obvious in the frequency response, but it appears as a ringing in the otherwise very clean MLSSA plot supplied by Audax). I could push the crossover frequency lower still, improving the vertical off-axis response, since the Scan-Speak tweeter can be comfortably taken below 2kHz, but that's a future potential tweak. I measured the responses of the crossovers with the drivers connected, and with simple zobel networks across each driver. The low-pass sections were within half a decibel of the target response, with good matching between channels. The high-pass leg, though, was disappointingly inaccurate, with the knee point too low, and the initial rolloff too rapid, although the channel balance was quite good. I measured the impedance of the tweeter with the naively-calculated Zobel network (Rz=4.9 ohms, and Cz=3.3uF) connected, and found it to vary substantially with frequency, going from 9 ohms at 1kHz down to 4.7 ohms at 3kHz, and then dropping to below 4.5 ohms at 10kHz. Given that I designed the filter for a 5 ohm resistive load, it's not surprising that the response was not what I expected. I experimented with various resistors and capacitors, without great success. I replaced the Zobel network with a circuit sent to me by Peter Dahl, which compensates for the resonance of the tweeter at 600Hz as well as for the inductance, and gives a much more satisfactory impedance between 4.75 ohms and 5.25 ohms across a wide frequency range. I could probably iron out the impedance trace still further, but I have better things to do with my time right now! The responses of the high-pass crossovers are now much more acceptable. I used Supersound polypropylene capacitors, and trimmed to the desired values with smaller polypropylene capacitors discarded from another project. The inductors are standard ferrite-cored items from Wilmslow Audio, which all had DC resistance less than 0.4 ohms (taking into account the paralleled resistance of the 1mH and 2mH), which I considered negligible for this design. I don't have an inductance meter, so I couldn't verify the values of the inductors, but I assume they are better than 5%. For preliminary testing I used paralleled 0.6W metal film resistors, with the attenuator resistors switchable by six-way double pole rotary switches. Once I settled on an attenuation I was happy with I hard-wired the resistors in - interestingly, I found this gave a significant improvement in performance, with more presence and detail than with the switches in circuit. I housed the passive crossovers out of the main cabinets, partly because I consider this good practice, and partly to allow easy tweaking. Their boxes also gave me a chance to practise my veneering skills before I put the finishing touches to the speaker cabinets! To my surprise, I found I initially preferred the result with a high attenuation of 6 or 7dB, with the system sounding a little dull with the expected 3 to 4dB. This disappointed me particularly since I had chosen a highly sensitive midrange driver to compliment my little Croft amps, but then had to throw away three or four decibels of efficiency. Eventually I found this to be a consequence of over-compensating for baffle diffraction losses (see below), and after I sorted this out settled for a more acceptable 4dB, which gave the most satisfactory balance. The plot on the left shows the convolution of the manufacturers' frequency response data for the drivers with the 4th-order L-R crossover filters, together with their complex sum. I know someone will ask whether the data include driver phase information - I calculated the minimum phase of the drivers using a Hilbert Transform program, and found that the amplitude error in summing the responses without taking driver phase into account was less than 0.5dB anywhere, so I ignored it. The dotted line shows the predicted effect of reversing the polarity of the tweeter - the cancellation is about 16dB, but including the driver phase could alter this. I was very pleased to find a flat response within +-1.5dB from 50Hz to 16kHz, though whether diffraction ripples, other reflections and room effects will in practice ruin this satisfying picture I have yet to discover. I would like to sort out the 1-2dB dips at 1kHz and at 4.5kHz, though I intend to make proper acoustic measurements of my own to verify these first. All the same, the predicted reponse is very encouraging. Having read John Murphy's excellent article on the diffraction step, I realised that the transition between the high frequency regime, where the sound is mostly radiated forward, and the low frequency regime, where some significant proportion of the sound goes around the back of the cabinet, was an important consideration. As it turned out, the speakers sounded rather thin and forward without any compensation. John's approach is based on Harry Olson's work on diffraction from free-standing enclosures of various shapes and sizes, and models the diffraction loss as a first-order 6dB step, which is 3dB down from the low-frequency asymptote at some frequency fb, related to the baffle size. The maximum cabinet width of my speakers is 24cm, and John's formula tells me this corresponds to a step centred at about 460Hz, although there are other dimensions larger and smaller than this. I added a single op-amp circuit at the input to the active crossover, which added a 6dB step down at a frequency adjustable from 280Hz to 1200Hz. In my room, however, I was never quite satisfied with the upper bass, which was always either too thin or too boomy. I had a suspicion that the 6dB transition theory was a little simplistic, as it assumes that all of the energy that is not beamed into the forward half-space is lost for ever, where common sense tells me that a large part of it will be reflected back from the rear and side walls of a normal listening room. I tried a 3dB step, and found this to give a much better subjective balance across the spectrum, in addition neatly solving the puzzle of the loss of output in the upper midrange I mentioned above. In the final version of the active crossover I plan to use 8-pin DIL sockets so I can easily plug in headers with the appropriate resistors, and so experiment with the step frequency and the amount of low-frequency boost. Here is the circuit I used, with equations for component values for a general step. 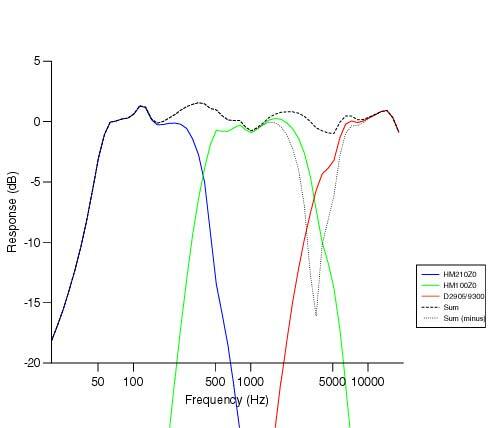 According to the plots supplied by Audax with the drivers, and confirmed by independent measurements in Hi-Fi World, the response of the HDA midrange unit, while generally unusually flat and smooth, has a 1-2dB dip in it, centred at around 1kHz. This isn't a huge problem, of course - most mids and mid-woofers have a far lumpier response than the HM100Z0 - but it is potentially correctable. HFW suggest using first-order high and low pass passive filters with this driver to iron out the lifts at lower and higher frequencies, but this of course decreases the effective sensitivity of the driver, and I have already padded it down by over 3dB to match the tweeter. It turns out that this trough can be neatly filled in with an active filter which introduces a hump at the right frequency to compensate for this. The change in the sound with a boost at 1kHz was interesting; 6dB or so of boost brought the sound forward somewhat, with a noticeable "zing", but with the planned 2dB the effect was more of an increased "rightness" to the sound of the system, and a marginally increased presence to instruments and singers. All the same, I ended up leaving the equalisation out of circuit, as on balance I decided the system sounded more transparent and natural without it. When I rebuild the active crossovers I'll put a relay in the circuit so I can switch it in and out to make the subjective differences easier to evaluate. I'd also like to see if this slight response anomaly is actually detectable in the overall measured frequency response of the three-way system. HFW suggest adding a phase plug to this driver to smooth out the response at the top end; experimenting with Blu-Tac cones on the pole pieces of the mid drivers had a subtle effect on the sound stage, but not a huge tonal change. I gather that Audax now sell the HM100Z0 with phase plug fitted as standard. I measured the response of the baffle step compensation and of the midrange equalisation circuits, and the results compared well with the planned curves. The advantages of high-order filters are that they allow the drivers to be used in the part of their frequency range where they are on their best behaviour, and that the vertical off-axis response is much less problematic. The disadvantage is the large phase rotation around the crossover point, with the attendant group delay problems. The audibility of phase distortion (especially in the presence of all the other distortions of conventional speakers) is still not established, and to me the many advantages of reasonably steep filters swing the balance (especially for an inexperienced designer). On the other hand, I suspect that, once the other problems with a speaker system and its interactions with the listening room have been sorted out, the improvement in impulse response with a linear-phase crossover would be audible. Besides, the purist in me doesn't like the idea of a speaker system which can't even reproduce transients correctly on axis in an anechoic room. I played around with linear-phase crossovers for a while, modelling them with a simple computer program. I worked out a design with symmetrical 18dB/octave rolloffs, but this had 4-5dB out-of-phase peaks at the crossover frequency and a wide overlap region, which would make the design of a three-way system more difficult. I haven't given up completely; my instincts tell me that linear phase is the way to go, particularly for the bass-mid transition, but the L-R will do for the moment. At least having a line-level crossover makes experimentation easy! The use of a filler driver, or "trinary crossover", to correct phase errors at the crossover point is an interesting idea, and is used by Orchid Audio for example in their PLL1 (which, incidentally, has the same HDA driver as my Neptunes). The problem with this kind of design, however, is that the filler driver is only fed by a first-order bandpass filter, which in the case of a little driver like this one can lead to distortion at low frequencies and the intrusion of the 5kHz resonance at the top of the band. This, by the way, might be the reason for the problems noted in at least one review of the PLL1, where the review reported "hardness" in the midrange. Indeed, Thorsten Loesch criticises HDA drivers generically, saying he hasn't enjoyed listening to any speaker system which uses them. I suspect that they are difficult drivers to use, partly because of the very sharp upper cutoff to their useable frequency range, and partly because of their lightness (they are unusually transparent to the returned backwave). Anecdotally, it is recommended that internal cabinet walls need to be kept well clear of the rear of the driver, and that they should either be used in an open-backed cabinet or have serious attention paid to dealing with the backwave. I wanted to separate the enclosure for the bass reflex from the one containing the midrange and tweeter, as these have rather different requirements. The midrange driver will perform best when it is loaded by a smallish, non-rectangular cavity, with plenty of absorbent material to absorb the back wave and with its internal resonances well spaced and damped. The bass enclosure needs to have plenty of internal volume while being solid and well braced, with internal waves less of a problem. The tweeter, of course, is much less fussy, since it is closed at the rear, but it will perform more smoothly in a baffle with an irregular, rather than square, shape to give a more even frequency spread of the diffraction ripples. These considerations led me to build each speaker as two separate boxes - this suited my limited woodworking skills, too! Practical considerations aside, this turns out to be a rather similar-looking design to the Wilson System V, though my speakers are far from being Wilson "clones". 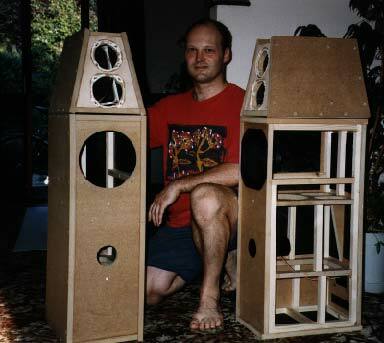 The WATTs are designed as standalone, almost full-range, monitors, so they have a mid-woofer with its own reflex port, rather than a true midrange driver, and the resources I had available to me didn't stretch as far as Wilson's massive polymer and lead composite cabinet construction (or the PUPPY's dual woofers). The woofer enclosure is built from 18mm MDF, and houses the single 210cm HDA driver and a forward firing, 64mm internal diameter port. I used a jigsaw to cut out the large pieces, and to make the rough holes for the drivers and the ports, which I then enlarged to the desired size with a file. I put plenty of bracing in, including 20mm battens along all internal edges and across some of the faces, two shelf braces, and three angled braces to break up interior resonances. I added two or three further angle braces to each of the big boxes after the picture on the left was taken, notably one directly behind each woofer and angled down at 45 degrees. Its internal volume was nearly 50 litres to start with; I guess with all the bracing and lining it is probably now somewhere between 40 and 45 litres, which is close enough to the target enclosure volume for the HM210Z0. The baffle is laminated with 6mm and then 1.5mm plywood, allowing the drivers to be easily flush-mounted (I don't own a router yet), the outer sheet also overlapping the ends of the side panels to neaten up the front of the box. All interior joints were generously glued with Evo-Stik Resin W, and reinforced with 35mm countersunk screws, whose heads were filled in before veneering. All inside surfaces are lined first with "Dedshete" bituminous sheet, then with 3mm lead sheeting, and finally with thick carpet underlay, all fixed with nails and No More Nails (!) adhesive. The single pair of gold-plated terminals (with lead sheet glued to the larger areas of the inner face to suppress vibration) was mounted at the rear toward the bottom of each cabinet, and internal wiring was made with heavy-duty OFC cable from Maplin. I screwed in four spikes under the bass cabinets, 2.5cm from each corner. 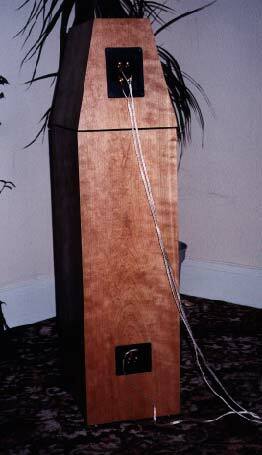 Before I added the angle braces and the underlay, there was an audible "bong" at about 500Hz (corresponding to the front-back distance), with a decay of about a second, but these last modifications rendered the MDF enclosures acoustically quite dead, though with a slight, but audible "woody" tone when rapped. There is still a slight "hollow" coloration in pink noise at around 250Hz (presumably corresponding to the vertical dimension of the cavity), but I'm not convinced I can detect it in music, so I've left it untreated so far. I'm not really convinced that the Dedshete (never mind the pricier and even less substantial Deflex) can have much of an effect by itself on 18mm MDF, since its mass is almost negligible by comparison, but it's inexpensive and widely recommended. I experimented with lead and Dedshete on scrap pieces of MDF before I installed the lead inside the cabinets (as much to find a secure mounting method for the lead as to determine its acoustic benefits!) and found that using the constrained layer arrangement was highly effective in damping vibrations with 12mm MDF, compared either with MDF/Dedshete or MDF/lead. The effect was less noticeable with 18mm MDF, presumably because of the lower mass ratio of the lead to the fibreboard. I avoided putting much damping in the interior of the boxes, so as not to detune the reflex port (though Vance Dickason suggests that stuffing material has rather less effect on total losses than cabinet wall resonances and leaks). The final incarnation of these speakers with the lead lining definitely sounded more "out or the box" than without it, though I made other changes so I couldn't say for sure that the lead was the only cause of the improvement. The midrange/tweeter cabinets are again made from 18mm MDF, and are in the shape of a rectangular-based truncated pyramid. There is a single vertical shelf brace, and the enclosures were similarly lined with Dedshete, lead and carpet underlay. 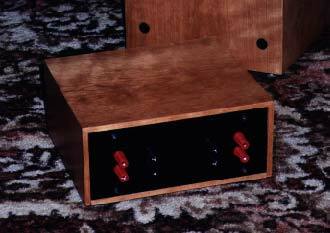 The baffles were laminated with 4mm birch plywood front and back, which neatly eliminates the need for routing to flush-mount the drivers and the terminal plates, and conveniently adds rigidity to the cabinet (though whether a midrange cabinet should be simultaneously rigid and massive is debatable). Because internal reflections and resonances are far more detrimental in the midrange, I filled with the boxes with long-haired wool: densely at the rear of the boxes, but grading to quite loose behind the drivers, contained in three hairnets (lightweight, mid-brown!) per speaker. I haven't found a material which absorbs the back wave from the driver to my own satisfaction - a clump of the compacted wool next to my ear doesn't have much of a subjective effect, nor does BAF wadding. Glass fibre is a possibility (I have a ten centimetre thick layer of the stuff on the floor in the loft! ), but I don't like handling it unless I have to. The lower internal face of the cabinet was lined with a piece of Deflex; this material is costly, and I'm still not convinced that it can work effectively as claimed, but any help in dispersing standing waves in this enclosure is welcome. To start with, I used Blu-tak to mount the midrange/treble enclosures on top of the woofer boxes. I found that this led to a rather muddled sound, and I realised (after a few days' reflection!) that the reason for this was obvious. The bracing and angle shelves in the boxes containing the woofers were intended to raise the cavity resonances in these boxes to well above the passband of the drivers in this system (about 400Hz), while not appreciably damping the resonances (lowest frequencies 500Hz and 800Hz). This works, of course, when the only acoustic input to the cabinets is from the woofer, through the low-pass filter preceding it. Tightly coupling the midrange/treble enclosure to this box allows the vibrations from the high-pass sections to excite all the internal resonances of the lower cabinets, both colouring the sound and destroying the system's imaging capabilities. I found that replacing the Blu-tak with small (about 4mm thick and 10mm diameter) rubber feet gave large improvements in clarity and imaging. I mounted the drivers with Allen bolts (4mm for the tweeters, 5mm for the mids and woofers), mating with T-nuts fixed to the rear of the baffles. I used expanded polystyrene draught excluder foam as a seal behind each driver, although the woofers and tweeters are now set too deep into the baffles, so I'm looking for some 2-3mm thick rubber sheet to make sure these drivers are properly flush mounted. The twin terminal plate took up much of the rear of each of the upper boxes, and I used Maplin silver-plated stranded OFC cable internally, identical to the exterior cable I use. I used high-current Maplin OFC cable between woofers and terminals. Each of the lower boxes is supported by four 8mm spikes. These speakers are very heavy and inert! A pair of boxes for one channel weighs over thirty-five kilograms, and at about a metre high, 25 centimetres wide and 38 centimetres deep, they are rather prominent in my average-sized living room, although their deep but narrow proportions mean they don't look so imposing from the listening position. This process took more than three weeks, and was the most challenging and time-intensive part of the whole project. I think my learning curve was the steepest of all during this time (quite apart from having to explain the veneer chips trodden onto every carpet in the house, and the all-pervasive smells of ageing hide glue and Tung oil!). What I ended up with had the odd crack in the veneer and a couple of untidy corners, and certainly couldn't be compared with what a proper cabinetmaker would produce, but once they were set up in the living room the minor blemishes were less obvious than I expected. I am still very proud of having come all the way with my first project, and without a complete set of professional tools or a proper workshop. I now look at the little upstairs spare room where all the sawing, gluing and swearing went on, and can't imagine these big boxes ever taking shape in there! Before you apply the glue to the veneer, damp the reverse face with water. This stops the veneer curling up like a dying leaf as the glue dries (although it curls up in the opposite direction until you put the glue on, of course!). If you cut the driver holes in the baffle before you veneer, cut a couple of slits across the grain of the veneer inside each hole, while it is still damp. If the veneer splits as it contracts on drying, this prevents the splits extending into the bits you want to keep. If you're using cherry veneer (or solid cherrywood for that matter) keep it out of the sun. It darkens markedly under UV radiation, which is OK until you leave the box by the window with something sitting on it - result, one pale silhouette on your speaker. For ported designs: if you can glue a port tube into its hole from the reverse (inner) side of the baffle, do this after the veneer is glued down, but before you cut out the final port hole in the veneer. Put insulating tape around the inside lip of the outer end of the port before you glue it in - this helps protect the inner surface of the tube. These steps give a nice neat appearance to the port, with no exposed ends of PVC tubing. If you use a household iron that is subsequently going to be used for its original intended purpose, use a sheet of kitchen foil between the iron and the veneer, ensuring you always have the same side of the foil uppermost. You will still get one or two discolorations on the sole of the iron, but these can be scrubbed off with a little washing up liquid and hot water. You will definitely want to avoid the smell of burnt glue, not to mention the potential consequences on domestic harmony of buggering the iron. I found that when I was veneering the larger surfaces, particularly the 40cm by 75cm side panels, the veneer tended to split very easily. I filled the smaller cracks with wood filler, masking off the veneer each side with sellotape and sanding the dry filler. With cherry, at least, darker filler works better than paler - I used a blend of "light wood" and "mahogany". I fixed the larger gaps with wedge-shaped inserts stuck down with PVA glue, and these worked well, disappearing to all but the most probing eye. I based the design of the grilles on the ones from my ProAcs (which normally resided in the cupboard!). The frames are made from 6mm MDF, cut out to about 1.5cm from each edge, with the front edges beveled at 45 degrees, and I painted them black with blackboard paint before the fabric was stretched over them and then glued and stapled into place. They are mounted onto the speaker baffles with standard plastic mountings, four per grille, attached to the baffles and grilles with Araldite epoxy adhesive. The frames are a little close to the tweeter domes, which means that the best results will always be obtained with the upper grilles off, though I plan to experiment with absorbent material on the inside edge of the frame where it is close to the tweeter. I was surprised to find that the grilles on the bass cabinets also muddled the sound significantly, presumably because the large unconstrained area of the frames vibrates freely. If I can get hold of some 3-4mm thick black felt I'll see if covering the rear of the frames improves things, both by damping vibrations and by holding the frames to the baffles more firmly. I was pleased with the results - they look rather smart, considering how straightforward and quick they were to put together. As soon as I first put the drivers in the boxes and connected the speakers to my system, they sounded "impressive". They certainly sounded strikingly different from the ProAc Studio Ones right from the start, even with the hissy, buzzy all-active crossover arrangement. The most obvious difference was in the bass, which had a startling power and depth; Pink Floyd's "Cluster One" now sounds like bits of planet grinding against one another (which is, apparently, what was recorded), instead of someone walking through snow. The speakers also sounded much cleaner and immensely detailed, almost to the point of discomfort. My wife described the sound as "like a huge pair of headphones". All the same, I wasn't completely happy - the sound was of a "big hi-fi", but not quite right. After a while, as I began to sort out bugs such as the diffraction compensation and the mounting of the upper boxes, I started to lose the feeling that the speakers had a particular "sound", and I became much more satisfied with them. When I dismantled them for veneering, after nearly a year of continuous use in the living room (yes, I have a very tolerant wife! ), I temporarily replaced them with my old ProAc Studio Ones. This was interesting, as I soon found I missed the scale, the explicit midrange detail, the unforced dynamics and the extended, controlled bass of the bigger boxes. I didn't notice much of a difference in tonal balance at this stage, but then that's not so surprising as after seven years or so of living with them, the ProAc sound was probably my unconscious benchmark when I balanced my own speakers. With the passive mid-treble crossover and the diffraction compensation, the speakers sounded rather more comfortable to listen to, and much more natural, although there is still a little residual hum, which I hope to be able to eliminate when I rebuild the active crossover and incorporate balanced connections. A recording of Beethoven's Piano Concerto No. 4 (Kovacevic) gave a strong central image of the piano, with the orchestra spread behind it, and with plenty of presence and detail in individual instruments and sections. The string tone was surprisingly sweet and natural (for a CD recording! ), with plenty of bite and body from the 'cellos and basses. Going back to Pink Floyd, I hadn't realised how well-recorded "Atom Heart Mother" was; the background outdoor sounds on "Fat Old Sun" sounded very natural and well textured, with the guitars in the foreground very vivid. When the eggs started to fry on "Alan's Psychedelic Breakfast", I almost stepped back to avoid the spitting oil! I use a stereo 75W solid-state amplifier, based on Maplin's popular 50W kit, to drive the woofers, and one of the Crofts for the mid and treble. I found that the speakers sounded much better (as might be expected) with the solid-state amp driving the woofers - I seemed to lose much of the bass detail and drive when I substituted the other Croft in the bass. Swapping between the SS and valve amps on the mid-treble was interesting: with the latter I felt I lost a little detail and the sound became quite warm, while with the solid-state the system sounded very clean and detailed, but less relaxing. In the end, I stuck to the valves for the sheer long-term listenability. My feeling is that the Croft is hiding some of the potential of the high-quality drivers - I'd love to hear what a state-of-the-art valve amp from the likes of Audio Research or Conrad Johnson would sound like here, or perhaps one of the better and more reliable single-ended triodes, There's a future DIY project, perhaps. In general terms, I like the detail and the authority in the sound of these speakers. The imaging is solid and stable, with solo voices in particular having plenty of presence. I'm also struck by the natural delicacy and the amount of detail in the upper midrange and treble, especially when listening to music on vinyl. One thing which does please me is the way these speakers seem to complement the music I play on them - I find I can listen to and enjoy recordings I used to think of as too dull or too bright, and there seems to more information on some of my LPs which were distractingly noisy before. The exception to this is that it does reveal more than my previous setup a slight tendency towards what I can only describe as "sameness" in recordings on CD, and a lack of tangibility and body to the imaging on digital recordings (though this could just mean it's time to upgrade my CD player!). My only real complaint now is that the soundstage doesn't have much depth behind the speakers, but I suspect that this could be a problem with the room, rather than with the speakers - the ProAcs sounded much the same in this respect. 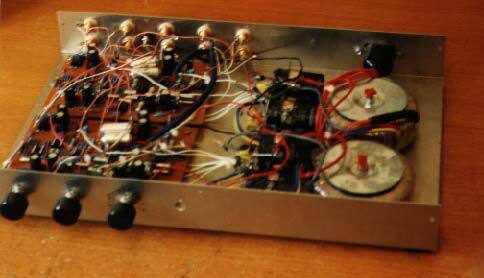 I'd also like to experiment with different power amplifiers. Using spot frequencies and warble tones, I suspect that the region around 2kHz is slightly emphasised, though I need to do some proper measurements to confirm this, and this again could be a room problem. Why Neptune? My day job is as an oceanographer, and Neptune is the Roman god of the sea. Recent pictures from the Voyager 2 probe of the planet Neptune show an extraordinarily beautiful deep blue sphere, with wispy white clouds whizzing around the planet at hundreds of kilometres per hour. Holst's "Planets" Suite portrays Neptune as "the Mystic", as if standing at the gateway to another world, and the music seems to beckon one away into the unknown as it finally fades into silence. What has this to do with loudspeakers? Not much - I just like the name and its various associations. The marathon (no, that's not quite the right analogy - marathons are over in a few hours!) task of completing this project is now done. This is after a year or so of gestation and then more than two years between bringing home the first batch of MDF and applying the last bit of wax to the cabinets. Given that I designed and built these speakers without using a microphone, and without even a token attempt to optimise the crossovers apart from the impedance corrections, I am rather pleased with the way they reproduce my precious music collection. I've gained plenty of experience during this project, which was quite a challenge for a newcomer to woodworking, and I'm proud of that. I can't see myself giving up the day job quite yet, though - even if I sold them for ten times the parts cost, I'd still be living on baked beans. If I could scrounge a pair of D2905/9500 tweeters on loan I would definitely like to see if they were a worthwhile plug-in upgrade to the 9300s. The limited-edition 9500 has the improved rear chamber of the 9900 Revelator, but is otherwise identical to the 9300. I would certainly like to rebuild the active crossover on a decent double-sided PCB with a proper ground plane to get rid of a slight hum, and more power supply regulation; I am sure that both steps would also improve the sound of the system. It would be fun to play with other op-amps too, though I suspect the law of diminishing returns may apply here. My preamp also is due for a rebuild, as the long stretches of signal-carrying wire between input sockets, source selector switch, volume control and then output sockets introduce an audible hum, especially at high volumes. I have fairly well-developed plans for a preamp with remote-controlled relay switching for the volume control attenuator and source selection, and balanced XLR inputs and outputs. I won't be able to resist fiddling with the crossovers for very much longer. I have an RS analogue SPL meter, and carried out the modifications recommended in Eric Wallin's article, as well as the provision via a switched jack socket for an external microphone. When I have the urge, I plan to measure the response of the drivers around the crossover points, and then optimise the crossovers to get something closer to ideal Linkwitz-Riley responses for the total acoustic and electrical combined response. I don't, unfortunately, have access to either an MLSSA system or a decent-sized room, so proper measurement is next to impossible. I have nascent plans for a pair of stereo closed-box subwoofers, possibly using the Avatar Audio Shiva or the Scan-Speak 25W-8565-01. I favour closed boxes over ported boxes here because of the room lift at low frequencies - putting a couple of subs in room corners should give a very nice extension down to below 20Hz, and design is much simpler than for ported systems. When I rebuild my active crossover I shall include a switchable low-frequency output for the subs, and I have already built a couple of Maplin's 150W MOSFET amp boards (I tend to plan in the long term!). The more I think about it, the more difficult the problems of the conventional approaches to speaker design - the limitations of analogue filters, both passive and active; internal cabinet reflections and resonances; driver breakup modes; storage and delayed release of energy in the enclosures; non-coincident drivers; room effects, and so on - come to seem. At the same time, it seems clearer and clearer to me that digital signal processing promises to be a hugely powerful tool for tackling some, if perhaps not all, these problems - and that's not a conclusion that an old analogue addict like me comes to easily! The most exciting idea at the moment is to use DSP to implement a linear-phase crossover, which has the potential to greatly improve the impulse response of the speaker system as well as allowing equalisation without having to use dozens of op-amps or introducing phase problems. The ultimate upgrade would of course be a larger and acoustically better-behaved room than the one I have now! A thread on the Multi-Way Speaker Forum designing a three-way speaker with the HM100Z0. I have learned much from my regular doses of the BASS list over the last year or two. I also owe particular individual thanks for advice from Peter Dahl, Thorsten Loesch, Louis Lung, John Murphy, Dave Platt and Larry van Wormer. Last and definitely not least is the lovely and long-suffering Brenda, who has put up with all the noise, mess and tantrums for all this time (and even tells me my speakers "look really nice"). After several years listening to the speakers with a a whole sequence of active crossovers, my frustrations finally got the better of me and I undertook to relegate all of these over-complex boxes of electronics to the garage and convert the speakers to passive operation. The story is here.